A Dark Chocolate Truffle Piglet from Hagensborg Chocolates, Inka Corn from Inka Crops, Chocolate Chunk Cookies from Skeeter Snacks, Mango Pear Pineapple squeezable snack from Fruit.o, Mini Blueberry Almond Crunch from Mrs.May’s, Turkey Bak Kwa Jerky from Little Red Dot Kitchen, Original Mulling Spices Blend from the Aspen Mulling Co., and Pumpkin Spice Decaf. Tea from Stash Tea Company. Out of this whole box there was only two brands that I was already familiar with – which is great, because Love with Food is essentially a food discovery subscription box service. Now I am already a massive fan of Stash Tea, and always have some in my cupboards nowadays. But I had yet to try their new seasonal Pumpkin spice tea – which I absolutely fell in love with! It tastes like thanksgiving in a cup. I also knew about Skeeter Snacks. I had discovered them in the swag exchange room at BlogHer and cannot get enough of these totally nut-free cookies- so even though I had tried them before, I was super thrilled to see them featured in this month’s box! The Inka Corn is really really yummy – it gives you plenty of tactile stimulation, and tastes like movie theatre popcorn! Harvested from non-GMO crops, Inka Corn has only three ingredients (corn, palm olein, and sea salt) and makes a great snack. 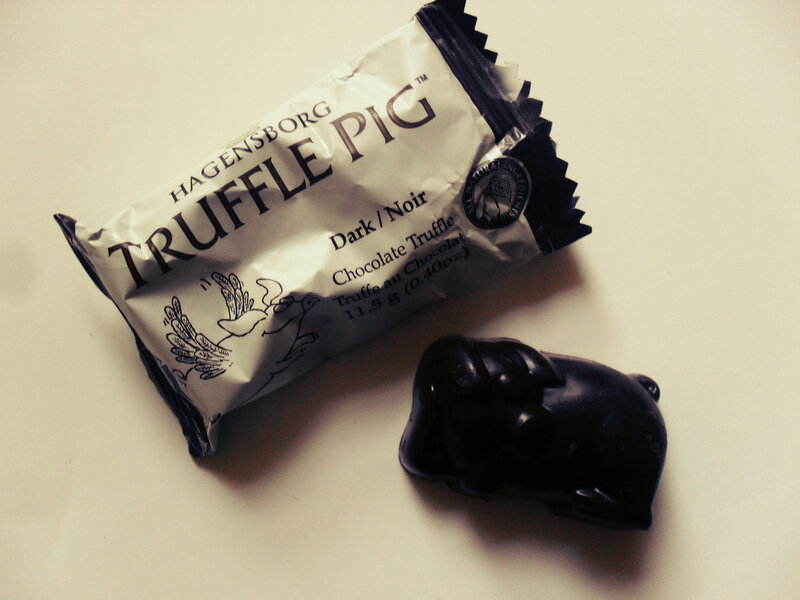 My mom also has a Love with Food subscription, so I was able to pilfer her Truffle Pig and try both the dark chocolate and milk chocolate versions – the packaging and truffle shape is adorable, and the chocolate was pretty good too (the dark one has a stronger, more chocolate taste). I have yet to try the turkey jerky and mulled spice blend – I’m saving the spices for Thanksgiving apple cider! The Mrs.May’s mini crunch had great packaging, and the product was cut into perfect little squares – but I can’t say that I was overly impressed with its taste or flavor. And the Fruit.o was great, I’m such a big fan of squeezable fruit since I tried the GoGo Squeeze in last month’s LwF box so I was thrilled to try a new brand this month. Fruit.o is almost like the grown-up version of GoGo Squeeze, they’re both super yummy and super convenient. Altogether the box was amazing – so kudos to Amy Roloff and LwF! Want to try out Love with Food for yourself??? 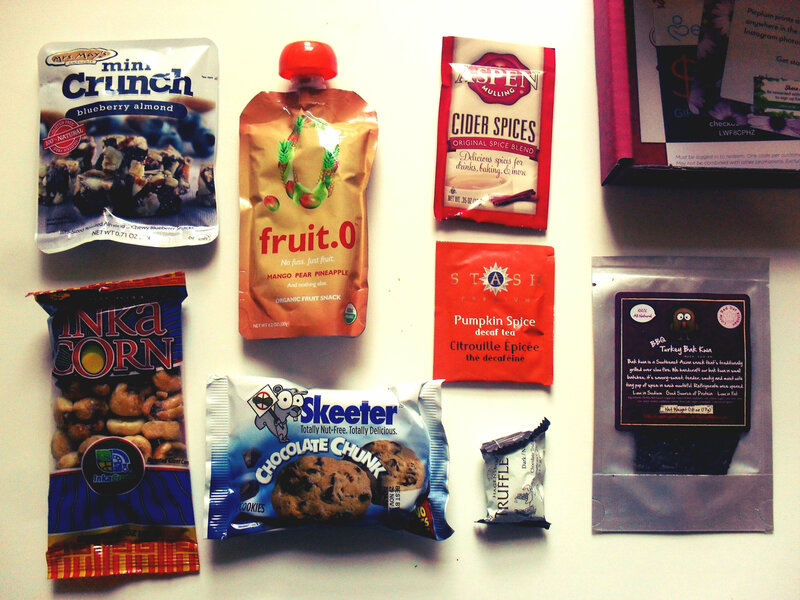 Now until 11/30 you can use the code ‘HOLIDAY12’ and get $5 off any Love with Food subscription plan! That means you would get your first box for only $7!!! It would be super if you could use my referral link here if you decide to give LwF a try! I can’t wait to see what LwF has in store for December – to see my review for their December box, make sure you subscribe via email, twitter, and/or facebook and never miss an update! Comments are always welcome! Next Post Boots No7 for Beautiful Skin!